LOTUS FLOWERS in NYC is known for being at the vanguard of floral and special events design. Lotus is the brainchild of owner and artistic director Luis Collazo. Taking a hands-on approach, Luis is personally involved in every aspect of his creations from conception through construction and presentation - fostering innovation while avoiding repetition and cliché. Known for his outside-the-box vision and thematic imagination, his arrangements have been described as “architectural and dramatic, yet classical compositions" while possessing "the intensity of works of art.” This artistry and dedication led him to be named Best Florist of New York by New York Magazine in the year 2000. Drawing his inspiration from nature and the fine arts, he has been influenced by contemporary artists and architects as diverse as Jackson Pollock, Lucio Fontana, Mark Rothko, Arnaldo Pomodoro, Francis Bacon, Henri Matisse, Alberto Giacometti, Frank Gehry, Frank Lloyd Wright and Zada Hadid. Other inspirations include the MET Opera, ballet, notably Wagner’s Ring Cycle, The Damnation of Faust, Atilla, Lucia di Lamermoor and last, but not least, The Magic Flute. His creations meld the timelessness of nature with 21st Century vision and aesthetics. Luis has the ability to customize his artistic vision to suit the individuality, vision and budget of his clients. 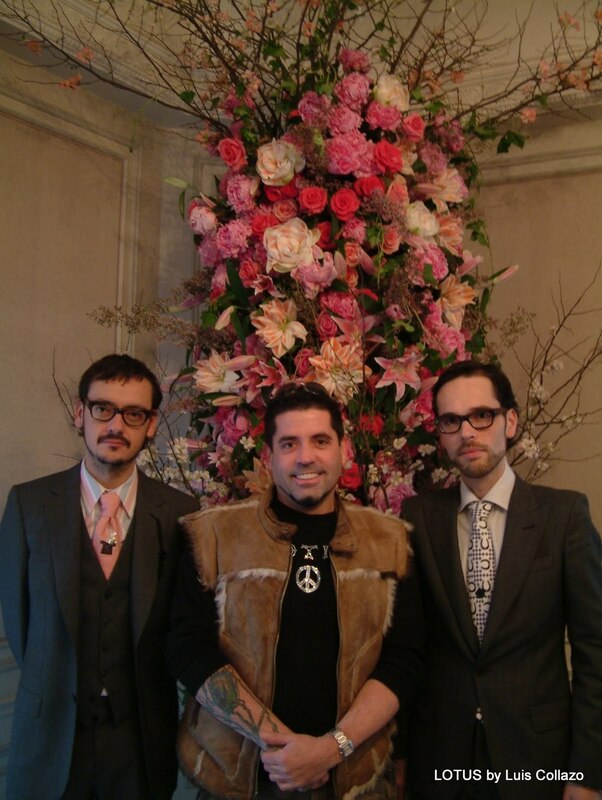 His activities include florals for corporations, private homes, venues such as the Brooklyn Botanic Garden, restaurants including Per Se, Betony, and Lincoln on a weekly account basis; and his forté - weddings and special events. A short list of the clients Luis has had the pleasure to work with include: Barbara Walters, Ivana Trump, Brooke Astor, Sarah Jessica Parker, Jennifer Garner, Liv Tyler, Kate Hudson, Anne Hathaway, Mickey Rourke, and John Leguizamo; from the fashion world, Valentino, Thierry Mugler, Viktor & Rolf and Moschino; as well as corporate and political giants such as Condé Nast, Pfizer, Henry Kissinger, President Barack Obama, Senator Charles Schumer, and others. Luis has worked with Chefs Thomas Keller, Jonathan Benno and Richard Capizzi for over 10 years and Chef Bryce Shuman since the opening of his new restaurant Betony. As director of floral design for Per Se Restaurant, Luis is continuously striving to accomplish the perfect balance between their philosophy, décor and his flower vision, while maintaining an impeccably harmonious environment. In direct collaboration with Chef Thomas Keller's impeccable team at Per Se, Luis is able to create spectacular arrangements on a weekly basis and also works directly with brides and event planners for Per Se's West/Special Events private dining room. Per Se provides Luis with complete artistic freedom in which to display his creative powers. His conceptual and sculptural design skills result in dynamic, yet elegant arrangements of highly cultivated sophistication.